St. John's Lutheran Church > Blog Timeline > Senior Ministry > Beasts, Blessings, and Billions! Yes! That’s Billions, as in dollars. If you have a friend who has everything, but you know that friend needs to do so some Christmas shopping for others, just gift him or her with a monetary gift card in any denomination. Yes. That’s right, you set the amount, even a bill…well, maybe not that much, but you get the idea. Still there is even more to discover at Seasons. From Angels to Zoo animals, Seasons Gifts has everything you need for a fabulous shopping spree! So, as we approach the Christmas shopping weeks, think of Seasons as a way of returning your dollars to help our senior members continue to travel, study and learn together, and ultimately, enjoy each other. But don’t think everything is for Seniors…some items are for infants or toddlers, others are for teens, cooks, or Dads…just come in and look for yourself! Among the more elegant things you will find is cashmere. 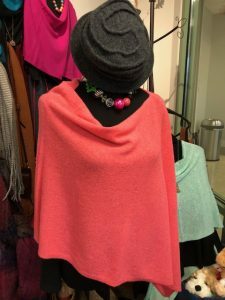 Found in bold and beautiful shades of vibrant pink, heather green, and coral, cashmere shawls and scarves can be monogrammed. 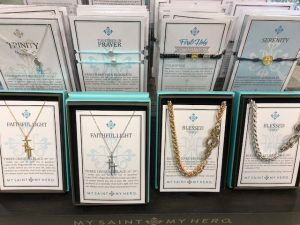 If you are looking to touch a heart, look for the My Saint, My Hero jewelry, created and blessed by a group who hopes to remind us all of the power of prayer. The company was founded on the belief that God is real, prayer works, and love heals. The wearable blessings empower women through meaningful work and are committed to the mission, “I am True, I am Good. I am Beautiful. I am Blessed.” If you want to give the gift of a blessing, these bracelets and necklaces are beautifully designed and range from just 15 to 50 dollars. For socially conscious teens or young women, Vintage Addiction canvas bags are an interesting and fun way to make a statement, with bags that read “TeachPeace”, “Live with Character”, or “Life is a Beautiful Ride”. The bags can be used for carrying books, as a purse, or as a computer case. Each bag is handscreened. These paired with Spoon jewelry are a great match for a youthful fashion statement. For children from birth to age 10, Seasons Gifts has interesting puzzles and Pretend Play games that are challenging, scholarly, and fun. For example, a color match game teaches not merely the color green, but chartreuse! The Pretend Play games create a setting complete with everything necessary to ”act out” a scene, including a diner game that comes complete with order pads, placemats, just about everything to stimulate learning and imagination! Perhaps best of all, in Seasons Gifts, is a special gift for seniors who are alone, whether from illness or loss. This, somewhat whimsical, item is a Sweet Beast that is created to be especially “attractive” to adults. Made to cuddle or share couch time, the creatures dispel loneliness or depression, simply by being present. Cute attached cards assist with an introduction between the adult and beast, easing the recipient into a relationship shared between the two. Many who are suffering memory loss enjoy cuddling. A beast is sized to fit in our arms. If you know someone who made the move into a retirement community, leaving a special pet with a family member, maybe a beast can help with the transition. Or maybe you know someone who has lost a spouse and needs to fill that empty space on the sofa—Welcome a beast! 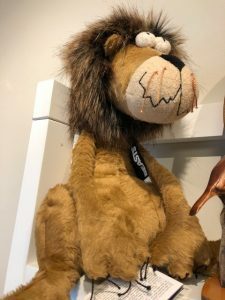 From fun goods for parties, ties and bottle openers disguised as tools for Dad, or precious cards, for special friends, there is a plethora of thoughtful, intelligent, and interesting merchandise in Seasons Gifts. And the proceeds are used to provide our seniors in a very special season of their lives a fun, stress-free adventure.